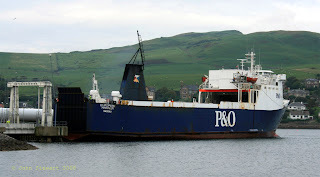 Seen berthing at Campbeltown's ferry terminal on Saturday afternoon is P&O's European Mariner which had arrived to embark a cargo of wind turbines (one of which can be made out beyond the stern) from Vesta's facility at Machrihanish which is scheduled to close later this year. Displacing 3046 tons, this ship was built by Rickmers Werft at Bremerhaven in 1978 as "Salahala". An account of European Mariner's Campbeltown "windmill run" can be found on http://larneferryweb.com/features/2007/windmills/windmills.htm.